Health care has emerged as the top issue for voters headed into the midterm elections, but fewer than half of them say they are hearing a lot from candidates on the issue, according to a new poll released Thursday. Seven in 10 people list health care as “very important” as they make their voting choices, eclipsing the economy and jobs (64 percent), gun policy (60 percent), immigration (55 percent), tax cuts (53 percent) and foreign policy (51 percent). Still, midterm elections are traditionally a referendum on the president and his party, and that holds true this year as two-thirds of voters say a candidate’s support or opposition to President Donald Trump will be a major factor in their voting decision, the poll found. 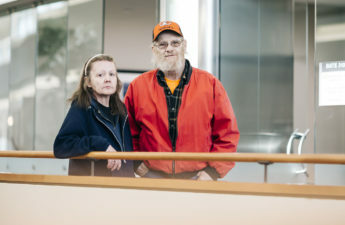 Health care was also the top issue chosen overall by voters living in areas identified in the survey as political battlegrounds, although the results varied when pollsters drilled down to political parties. 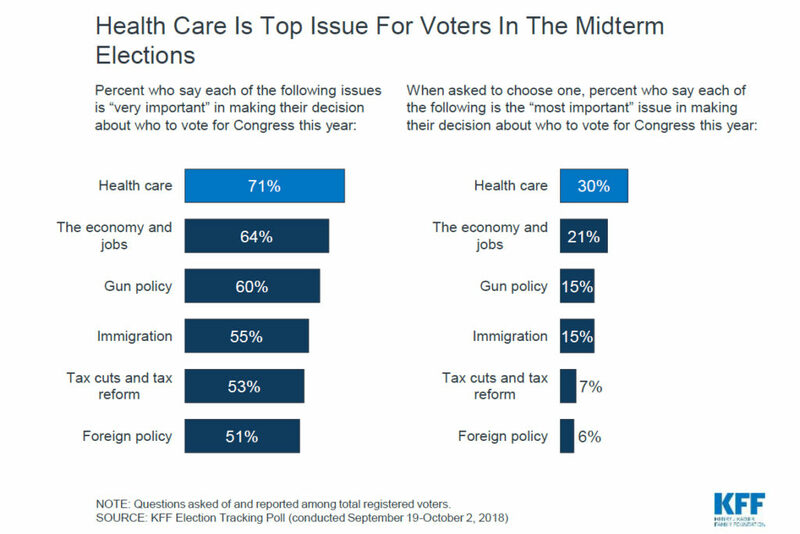 Nearly 4 in 10 Democratic battleground voters and 3 in 10 independents chose health care as their most important issue in voting for Congress. Among Republican voters, immigration was their top issue, garnering 25 percent compared with 17 percent for health care. 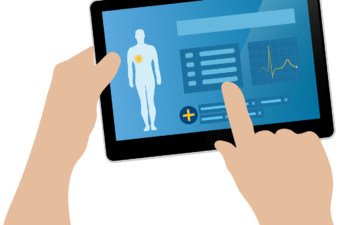 The poll results in two battleground states — Florida and Nevada — also underscored voters’ interest for keeping the Affordable Care Act’s protections for people with preexisting conditions, one of the most popular provisions in the law. Democrats have made that a key part of their campaign, pointing to Republicans’ votes to repeal the entire law and trying to drive home the message that the GOP’s efforts would strip that guarantee. 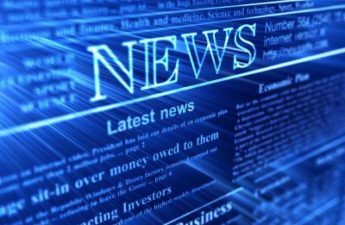 Nonetheless, Republicans have recently sought to fight back on that issue, promising on the stump and in campaign ads that they understand the need to keep the protections and would work to do that. Nearly 7 in 10 Florida voters said they are more likely to vote for a candidate who wants to maintain the protections for people with preexisting conditions, while 9 percent said they are more likely to vote for a candidate who wants to eliminate these protections. In Nevada, nearly 70 percent of voters also said they wanted the ACA preexisting protections guaranteed. In Florida, where the deadliest mass school shooting in American history took place last February, health care also was the top issue among voters. Twenty-six percent of Florida voters listed health as their top issue. The economy and gun policy tied for the second-biggest issue at 19 percent. The shooting at Marjory Stoneman Douglas High School in Parkland, Fla., left 17 students and staff members dead, spurred massive marches around the country and stirred national debate on gun policy. Florida is traditionally a key battleground state but more so this year with close races for the U.S. Senate and governor’s race hanging in the balance. Nearly half of Florida voters said they are more likely to vote for a candidate who wants to expand Medicaid. Florida is one of 17 states that has chosen not to expand Medicaid under the health law, leaving tens of thousands of its adult residents without health insurance. The Republican-controlled legislature has refused to accept millions of dollars in federal funding to extend the coverage. Two in 10 Democratic voters in Florida said support for a candidate supporting a national health plan, or “Medicare-for-all,” is the most important health care position for a candidate to take. Andrew Gillum, the Florida Democratic gubernatorial nominee, has said he would support a national health plan. 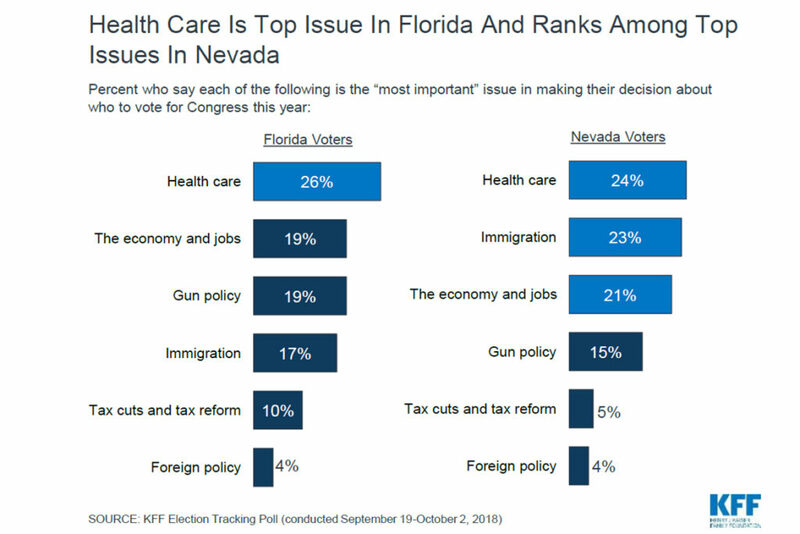 In Nevada, which also has a key Senate battle, the poll found nearly a quarter of voters said health care was the top issue in their decisions this year, but immigration and the economy were very close behind. Nearly a third of Democrats in Nevada said they are looking for a candidate who supports a single-payer health plan. Just under a third of Republicans in Florida and Nevada said that a candidate’s support of repealing the ACA is the most important health issue when they vote. The poll of 1,201 adults was conducted Sept. 19-Oct. 2. The national survey has a margin of error of +/-3 percentage points.